The settings icon (⚙) is located in the header of the informational panels, allowing one to perform actions or change preferences for the current panel. These setting can be changed at any moment while the program is running and are effective immediately. Refresh folders tree – re-reads the folder tree. This action is intended to sync the displayed file structure with the current one on the disk; useful if the monitoring of the creation of new files/folders (default setting for network collections and memory cards) is turned off. Mac: bundles (applications and disk images); folders, the names of which start with a dot; standard Unix folders like /usr, /bin etc. Show Drive/Folder icons – allows drive and folder icon display. Monitor removable media changes – allows automatic discovery and monitoring of removable media. Show unmoumted volumes (Windows only) – allows drive letter display when the media is offline. Shorten long folder names: for folders with names longer than 8 characters, the displayed name for the folder will be automatically shortened to fit in the window.This is done by removing the middle of the folder name from the display. Any folder names shorter than 9 symbols aren’t affected. 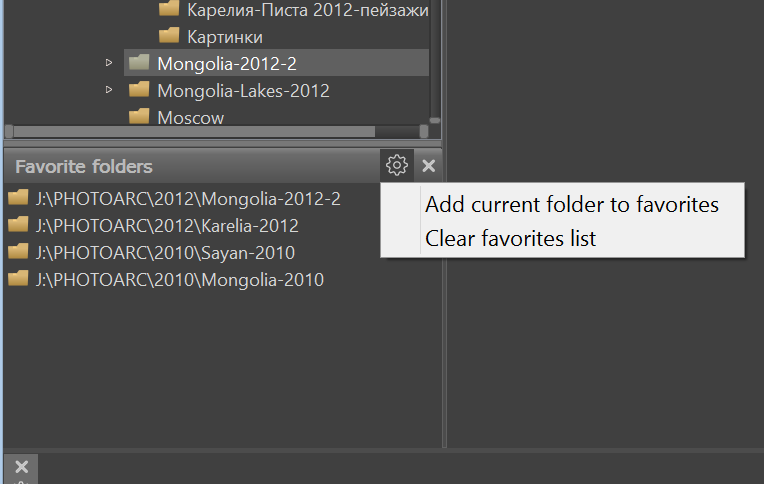 Show horizontal scrollbar: if enabled (default), Folders panel contents could be scrolled using mouse/trackpad. If disabled, then horizontal scroll of panel contents is completely disabled. Use natural folder sort order: consider digits in file/folder names to be ordinal numbers and sorts those numbers in numeric value order. Enable add/rename/remove folders – allows one to edit the folder tree. 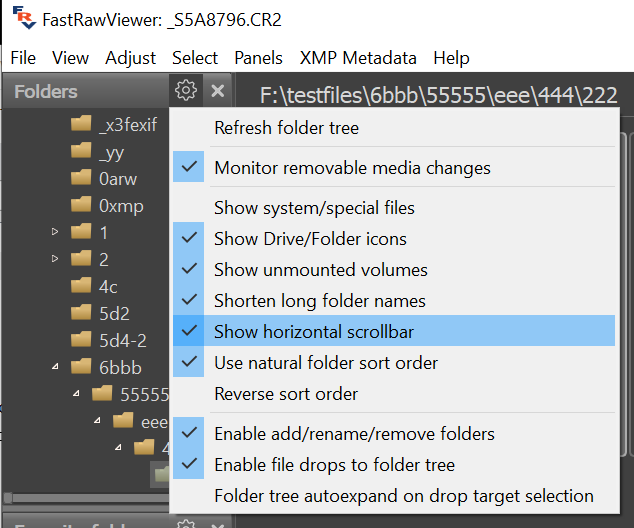 Enable file drops to folder tree – allows one to drag files into the folder tree. Clear favorites list – clears the list of favorite folders. Show filenames – sets a mode for file name display in the Filmstrip: don’t show, show under the icon, or show over the icon. Show Rating/Label – sets a mode for XMP Rating/Label display in the Filmstrip: don’t show, show under the icon, or show over the icon. 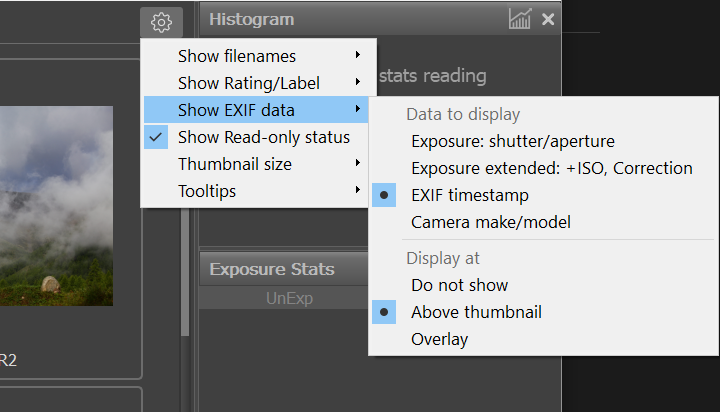 What to display: exposure (abridged), exposure (full), Timestamp, camera name, image pixel size. Where to show: Do not show, above thumbnail, overlay atop the thumbnail. Show Read-only status (Windows)/Show Locked/Read-only status (Mac) – read-only/locked files will be shows with a “padlock” symbol to the left of the checkbox mark. 11 sizes, starting with 75 and up to 600 pixels on the longer side. Display Thumbnails – allows one to turn off preview display, allowing only file names, and, if desired, XMP ratings/labels. To adjust the font size in this mode, first set the thumbnail size and only after that switch the previews off. Tooltips – what to display in the floating hints: Title, Description. The list of sizes is different: from 125 to 800 pixels on the longest side. There is no setting to switch off the display of Thumbnails. The up/down arrows allow one to move the groups of the displayed information. In each group, one can choose the elements that are necessary during display. Do not show empty values – forbids the output of empty lines (for which the displayed RAW has no data). 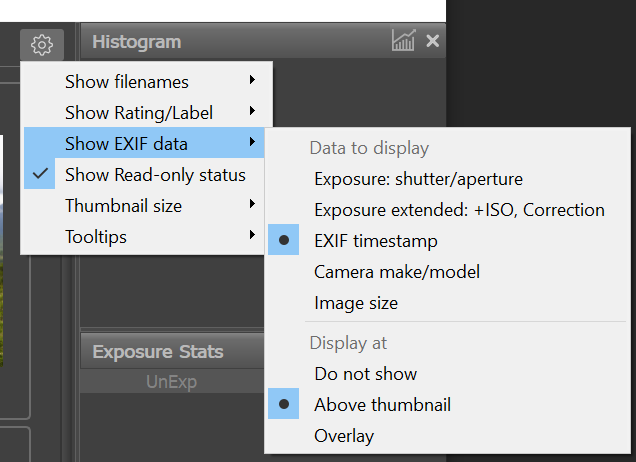 Show row labels – turns the left column of the EXIF-table (field names) on/off. Do not move – doesn’t move. Rating is set – moves when a rating is set. Label is set – moves when a mark is set. Rating or label – moves when setting either parameter. 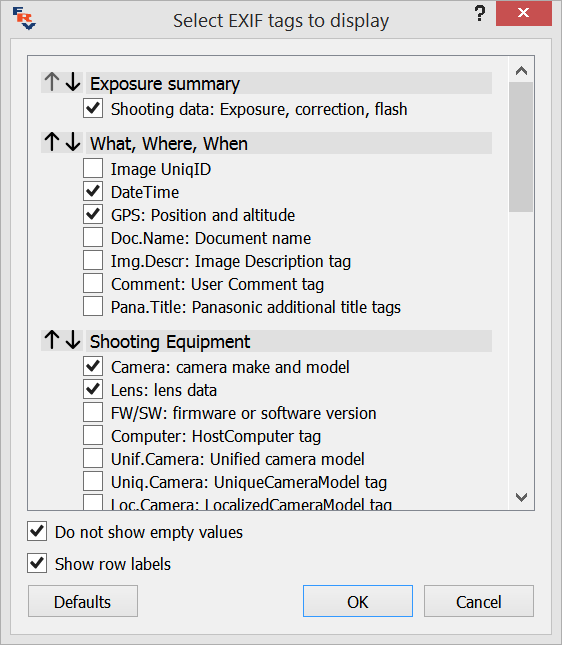 Show Title/Description – Shows the title and description in the XMP panel. Always display OE+Corr column: turns on the display of the third column of statistics (OE+Corr), even if it has the same values as the OveExp column. Display statistics in color: turns on the output of table rows in the color corresponding to the color of the pixels. The use of these items is described above in the “Sort & Filter” section. Show zero values for completely fetched data – if this setting is off, then the table display the lines that do not don’t correspond to any of the files in the current folder. Display is only turned off when the metadata for all of the files in the folder has been read. Hide groups with only one value – if the corresponding group (XMP Rating, Label, EXIF Timestamp) contains the same data; in other words, all of the files in the current folder fall into the same line in the group, the entire group will be hidden. Many control and information display elements characterizing the displayed image can be placed in the status bar. As a rule, all possible elements are not needed to the user (and they won’t all fit on a monitor of average resolution), so the display of these elements can be customized. For customization choose File – Customize bottom bar in the menu, or choose Customize Bottom Bar in the menu that pops up when pressing the settings button in the lower right corner of the program window (if you have not switched off the display of this icon). Visibility always: always shows the element. If the program window size is too small, then the elements will overlap. If fits: The element is shown only if the size of the window is such that the elements do not get in each other’s way. Hide: The element is not shown. File navigation buttons: Prev File/Next file button and current file number indication (this button opens up the set file by number dialog). Current folder: current folder being browsed. Current filename: File name (without the name of the folder). Current file selection status: Sel (in red) If current file is selected via Select/Batch, empty field otherwise. Selected files count: number of selected files (if any), empty field otherwise. EXIF summary: shooting data (exposure, flash, lens’s focal length). Zoom ratio and zoom buttons: current file zoom (clicking causes Fit to Window) Zoom In/Zoom Out buttons. File load/processing time: time spent on reading-decoding-processing the file in FastRawViewer. R-G-B-BW channel selector: Buttons for switching RGB channels and black and white representation. Exposure control buttons: current exposure compensation value (clicking on this turns on/off exposure compensation). Over/Underexposure buttons: Buttons for turning on/off the display of over/underexposed areas. White balance presets: choose preset WB. White balance manual tune: current white balance indication; pressing on it summons a dialog for adjusting white balance manually. Contrast curve selector: drop-down list of contrast curve choices. 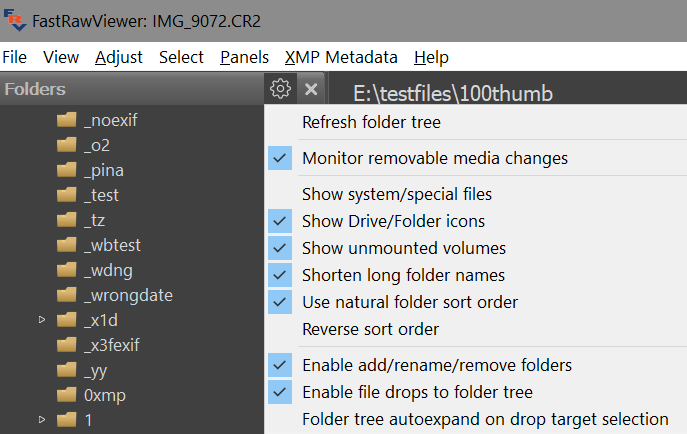 XMP Rating buttons: indication and control of XMP ratings. XMP Label indicator: indication of current XMP labels. XMP Label buttons: indication and control of XMP labels. Fullscreen, hide/show filmstrip/dock, and customize buttons: Fullscreen, hide/show filmstrip panel/all panels, and program settings block buttons. Maximum allowed – always maximum width.